Beth, Filipino, was appointed as Assistant Corporate Secretary of EDC on September 7, 2016 and then as Corporate Secretary on October 3, 2017. Beth is also Assistant Vice President and Senior Counsel at First Gen Corporation (FG). She joined EDC in August 2015, when she was seconded from FG to head the Legal Services Department. Prior to joining the Lopez Group, Beth was Assistant Vice President for Legal Services at Global Business Power Corporation (Global Power), where she also served as the Head of the Legal Department and Assistant Corporate Secretary of the Global Power subsidiaries. Before moving in-house, Beth built her legal experience first as litigation associate at Villaraza & Angangco, later joining the government as Court Attorney in the Office of then Chief Justice Hilario G. Davide, Jr. in the Philippine Supreme Court. Thereafter, she pursued and completed her Master of Laws degree at the University of Michigan in Ann Arbor, Michigan, U.S.A., which was followed by a fellowship stint at the Center for International Environmental Law in Geneva, Switzerland. 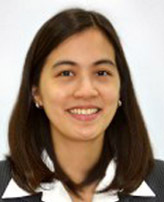 Upon her return to the Philippines, she transitioned into commercial law practice as an associate at Romulo Law Office. Beth obtained a Bachelor of Science degree in Management, Major in Legal Management in 1996 from the Ateneo de Manila University, where she also earned her Juris Doctor degree (with Second Honors Silver Medal Award) in 2000. She was admitted to the Philippine Bar in 2001. In 2006, Beth received her Master of Laws degree from the University of Michigan in Ann Arbor, Michigan, U.S.A., as a Michigan Grotius Fellow.